The Lockheed C-141 is in the Transonic Dynamics Tunnel being prepped for a test in November of 1962. 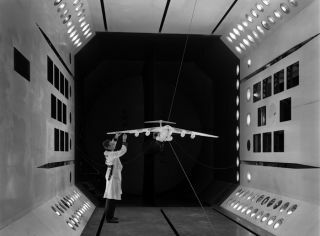 In this historical photo from the U.S. space agency, the Lockheed C-141 model is in the Transonic Dynamics Tunnel (TDT). By the late 1940s, with the advent of relatively thin, flexible aircraft wings, the need was recognized for testing dynamically and elastically scaled models of aircraft. In 1954, NASA's predecessor agency, the National Advisory Committee on Aeronautics (NACA), began converting the Langley 19-foot Pressure Tunnel for dynamic testing of aircraft structures. The old circular test section was reduced to 16 x 16 feet, and slotted walls were added for transonic operation. The TDT was provided with special oscillator vanes upstream of the test section to create controlled gusty air to simulate aircraft response to gusts. A model support system was devised that freed the model to pitch and plunge as the wings started oscillating in response to the fluctuating airstream. The TDT was completed in 1959. It was the world's first aeroelastic testing tunnel.